Seventeen of the game's top collegiate coaches have teamed up with the American Baseball Coaches Association (ABCA) to bring you the game's most comprehensive assortment of practice activities. Each drill follows a concise format. First, the primary skill or tactic to be enhanced is identified, then procedure and setup details are provided. Illustrations for proper technique are also included, followed by coaching insight to help you sharpen players' understanding of the game's finer points. Glean tactical advice such as how to get a teammate home from third when a key run is needed and how to "sit on" certain pitches while at the plate. Drill modifications are included so that each drill can be modified to fit specific needs. Additional chapters explain how to effectively and efficiently incorporate drills in practice sessions and to simulate game situations. 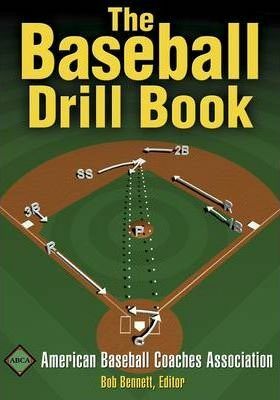 In all, The Baseball Drill Book provides the essential link between initial skill learning and winning performance on the diamond. The American Baseball Coaches Association (ABCA) is the largest baseball coaching organisation in the world, including coaches from every state in the USA and hundreds of international members. The association's mission is to improve the level of baseball coaching worldwide. The ABCA assists in the promotion of baseball and acts as a sounding board and advocate on issues concerning the game. In addition, the ABCA promotes camaraderie and communication among all baseball coaches from the amateur to professional levels. The ABCA also gives recognition to deserving players and coaches through several special sponsorship programmes. It is an organisation that has grown steadily in membership, prestige and impact in recent years.